Small Business Loan Program Opens Monday in Andover, Mass. Customers hoping to dine out Sunday night in the Merrimack Valley found some of their favorite restaurants are still shut down. "We were coming here for a big birthday party," Paul Senn said. "It was a surprise for the person." But the surprise was on him. The Indian bistro where the party was set to take place is one of many businesses still closed from the gas explosions more than two weeks ago. Even the restaurants that have reopened have lost thousands of dollars in revenue from being closed for days. Money was also lost in spoiled food. Firefighters in Andover, Massachusetts, were among the three communities racing to try and control the numerous fires that broke out Thursday as a result of a series of gas explosions in the area. 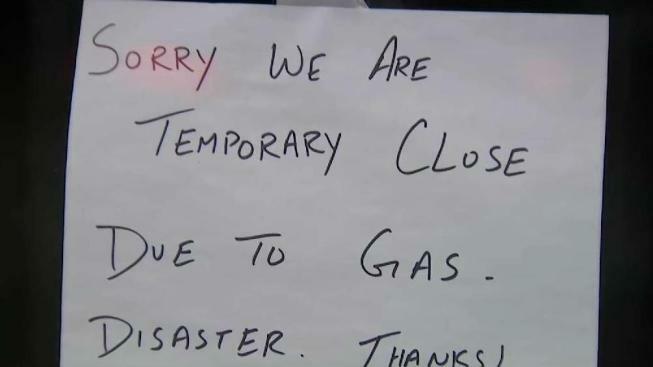 Many restaurants remain closed because they don't have gas. These closures are affecting not only the restaurants but also other businesses in the area. "We're lucky that we live close enough to walk downtown and enjoy it normally," Andover resident Adam Jackson said. "But we haven't actually been there at all." Now small businesses can apply for a loan from a new $1 million emergency loan program beginning Monday. The program will offer emergency loans of up to $50,000 to eligible businesses with no payments and no interest for the first six months, the Town of Andover said in a statement. Market rates will apply and loans will be able to be extended or restructured for multi-year term loans for those businesses that extend beyond a six month period. The fund was announced last week by Gov. Charlie Baker, Lt. Gov. Karyn Polito, Secretary of Housing and Economic Development Jay Ash, Lawrence Mayor Daniel Rivera, North Andover Town Manager Andrew Mayor and Andover Town Manager Andrew P. Flanagan. It is meant to help businesses affected by the gas emergency in Andover, North Andover and Lawrence. "Our small businesses are an integral part of our community and we hope this loan program will serve as a way for them to obtain the resources needed to reopen," Flanagan said in the town's statement. "We encourage all affected business owners to take advantage of this fund and consider applying tomorrow." According to Flanagan, the program will have an expedited application and approval process with the goal of getting all applications processed within 24 and 48 hours.